A small group of high school students who have already won $10,000 for solving an environmental challenge within the community is shaking things up by tackling Oklahoma’s earthquake problem. The STEM Club at Bethel High School incorporates science, technology, engineering and math in its weekly after-school meetings, and this semester the club is making a difference by increasing awareness of earthquake safety practices within schools. A seven-member group analyzed earthquake studies and created a free printable earthquake safety brochure for schools, available on its student-created website. In addition, the group, which calls itself The Earth Shakers, produced a short video illustrating correct earthquake drill procedures and presented safety lessons to children at Bethel’s middle school. “We are hoping more schools will start doing earthquake drills just as much as they do fire and tornado drills because there’s much more of a chance of earthquakes happening during school than a fire or a tornado,” said Alicia Mathis, who initially joined STEM Club to help her in math class. Annie Keehn, club adviser and a science teacher at Bethel High School, said earthquake awareness has become increasingly important in Oklahoma with the recent increase in seismic activity. The group’s involvement in safety procedures garnered the attention of State Secretary of Energy and Environment Michael Teague, who visited the school in January to talk to students about their Earth Shaking Project. The Earth Shakers entered their homemade earthquake resources in the second part of the national Lexus Eco Challenge competition, which calls for students nationwide to address air and climate issues. In October, the other eight students in the STEM Club, The Noteable Recyclists, submitted an action plan for the first part of the Eco Challenge, addressing land and water conservation. They won one of the contest’s biggest prizes: $10,000. Bethel lost its recycling program last year when its recycling provider started charging for services. With no money in the school budget to continue the program, the students sought ways to recycle internally, which led them to develop a method to create notepads from discarded copy paper. The students then created a website and produced a video demonstrating how to make the notepads with everyday classroom objects such as rulers and glue guns. As part of the $10,000 prize, each student received $875, which will help pay for college, a first car for one student and a mission trip to South America for another. Of the remaining prize money, $1,000 will go toward expanding club activities. In the fall, the students hosted a homecoming dance to raise money to attend a genetics conference. The final $2,000 of the prize money will be used to reestablish the recycling program at the school for years to come. “I’ll be gone, but the recycling will go on,” Mathis said. Keehn said the recycling program has been missed. The school has been fielding phone calls from members of the community asking where the outdoor bins went. She hopes with their return and the publicity the STEM Club has been generating, people who didn’t recycle before will be encouraged to join in when the bins return to the school. Mick said STEM Club has taught her a lot about finding solutions to problems and pursuing her goals. “This really opened up a lot for me. I want to be a registered nurse. It was a dream at first, but now I know I can actually do this. It put a lot of drive in my heart for what I really wanted to do, and it proves we can do what we want if we really set our minds to it,” Mick said. Ryan Sanchez, who is choosing between a future in epidemiology and microbiology, said she has learned about future careers through her involvement in the club. “We learned a lot about STEM jobs in the real world to help us narrow down what we want to do. STEM jobs are going to be the most important jobs in the next couple of years. Now that we know our strengths and weaknesses, it’s easier to figure out what we want to go into after high school,” Sanchez said. Russell McCreary II, a sophomore who wants to become an oncologist, said the camaraderie with like-minded students made the groups successful. “Working in groups really brings out what you like to do and what your strengths and weaknesses are, so you can use that information in your career,” McCreary said. Keygan Veeley, a STEM Club member who was also selected to serve on State Superintendent of Public Instruction Joy Hofmeister’s Student Advisory Council, said the students learned a lot about solving real-life problems. “The whole group came together and worked together on an idea and tried to find the best way that we could make notepads efficiently,” Veeley said. In addition to sponsoring the STEM Club after school, Keehn has gained recognition in the state for her work in the classroom. Keehn is a 2016 recipient of the Rising Star award, given by the Oklahoma State Department of Education to teachers who demonstrate great skill and potential. She designs her lessons so that students see the relevance in their own lives, which keeps them engaged and helps them retain information. As first-round winners of the Eco Challenge, The Noteable Recyclists will tackle another environmental issue this spring when they compete against 14 other teams across the nation in a final, third round of the challenge for the grand prize: $30,000 in college scholarships. 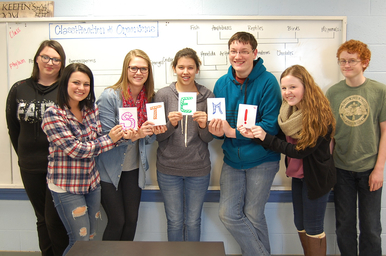 To learn more about the work of the Bethel STEM Club, visit www.theearthshakingpro.wix.com/theearthshakers and http://rmccreary99.wix.com/thenrproject. 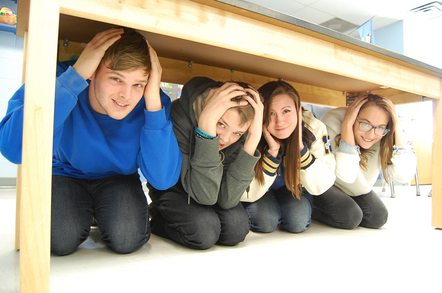 Members of the Bethel STEM Club demonstrate steps to take in the event of an earthquake. Their earthquake safety awareness initiative garnered the attention of State Secretary of Energy and Environment Michael Teague. From left to right: Dakota Mullendore, Chase Smithey, Brittany Stroud and Holly Naylor. Members of the Bethel STEM Club developed a method of creating notepads out of old paper using everyday supplies. Their innovation earned them a $10,000 cash prize. From left to right: Samantha Tipton, Carrie Mick, Alicia Mathis, Ryan Sanchez, Russell McCreary II, Jacqueline Fuller and Duncan Thiemann. 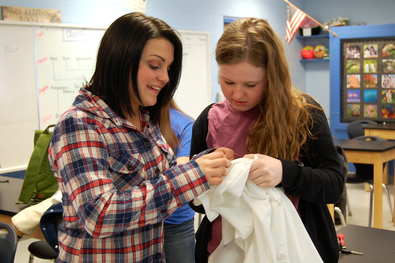 Carrie Mick and Jacqueline Fuller, members of the Bethel STEM Club, are excited about their new lab coats. 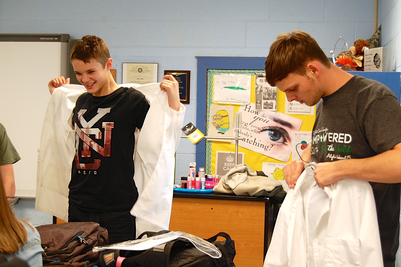 Chase Smithey and Dakota Mullendore try on new lab coats that were purchased after the Bethel STEM Club won $10,000 for its recycling initiative.